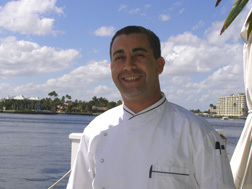 The Secret Garden at The Pillars at New River Sound is an enchanting restaurant in Fort Lauderdale, Florida where spectacular views of the prestigious mansions that line the Intracoastal Waterway complement the exciting cuisine of "Chef G" (Djillali Mezali). 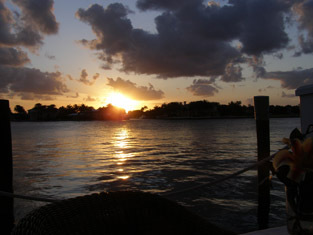 In was late March 2009, the day had been bright and beautiful, and the evening promised a sunset that was worthy as a grand finale as the sun sparkled on the water as it slowly started making its farewell. Sitting on the dock of The Pillars at New River Sound in The Secret Garden under a large ivory market umbrella in comfortable rattan chairs with gold cushions flanking a round table draped with ivory linens and set for two with matching Frette ivory napkins, Edward and I eagerly looked forward to watching the night unfold. The setting was romantic, pink and white striped lilies in a glass vase accessorized our table along with a bronze beaded candle holder, a soft breeze gently rustled through the palm trees, reddish orange hibiscus provocatively beckoned from the garden, along with wax begonias, bougainvillea, pink and white impatiens, tropical plants, and gorgeous orchids combining in a heady aroma that gently perfumed the night. Isabella, our server, began our evening with glasses of François Montand, Blanc de Blancs, champagne to toast the sunset as we perused our menus. When you know that a menu changes daily, one must take extra care when making your dining selections, however when she told us about the Prosciutto Wrapped Sea Scallops and the Smoked Baby Clam Chowder on the night's menu, it made our choices easier. While we waited for our appetizers to arrive, Isabella brought us a basket of hot bread and a tasty spread made from potatoes, white truffle oil, garlic, and calamata olives, which was the perfect accompaniment as we watched the passing yachts, and the sun, a glowing orange ball in the sky illuminate the low slung cumulous clouds before it slowly slid from sight into the water creating a most spectacular sunset. 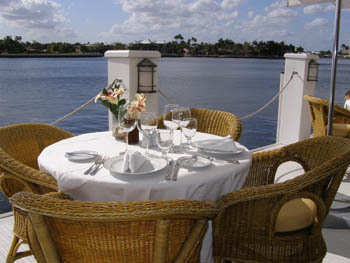 The arrival of our first courses coincided with the lights coming on in the multi-million dollar homes located directly opposite us on the other side of the Intracoastal Waterway, and the sconces that softly illuminated the dock. Edward had the Prosciutto Wrapped Sea Scallops, two large and succulent scallops wrapped with prosciutto that were pan seared in brown butter sauce to achieve a crispy crust and presented on a bed of wilted spinach and white truffle mini risotto cakes, with a scallion brush garnish, and zigzagged flavorful embellishments of red pepper coulis and balsamic reduction on the plate. When Isabella removed the lid to my Smoked Baby Clam Chowder, its aromatic fragrance captivated me before I had even sampled a spoonful. The chowder was really wonderful, generous with succulently sweet and smoky baby clams, diced carrots, celery, potatoes, and rich with cream, and I especially enjoyed the subtle smokiness, which added another level of interest. For his second course, Edward continued with delectable Duck Breast au Poivre, which really sung, presented as ten slices of perfectly cooked duck breast that was dusted with five crushed peppercorns and pan seared with Cognac, cherry wine demi-glace, light cream, and served with roasted garlic mash, haricots verts and carrots, and was paired with a 2006 Cartlidge & Browne Cabernet Sauvignon that had ripe dark berries and cassis on the nose and palate. 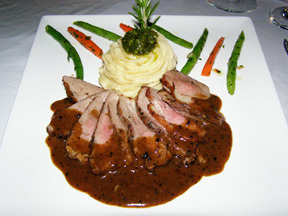 Beautifully presented, Chef G arranged the duck slices in a large fan shape and ringed them with the rich sauce, a generous serving of piped mashed potatoes enhanced with a pesto crown and a fresh rosemary plume as a garnish, and blanched harticots verts and carrots that added color to the dish. 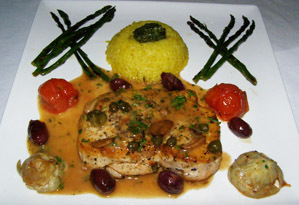 I had the Mediterranean Style Swordfish, which Chef G had purchased that morning, that he sautéed in virgin olive oil and garlic, with cherry tomatoes, artichoke hearts, calamata olives, and capers, in a white wine lemon butter sauce, accompanied with saffron jasmine rice and grilled asparagus. This was a stunning presentation where Chef G really worked the square white plate to its advantage, arranging crisscrossed thin stalks of asparagus in the top corners of the plate flanking the yellow mound of saffron rice crowned with pesto, with the swordfish bathed in a pool of sauce and topped with capers occupying the lower center of the plate, with stewed tomatoes and scattered calamata olives, and artichoke hearts balancing the lower corners of the plate. This visually stunning course had exceptional flavor to match its presentation, and was well paired with a 2007 Cartlidge & Browne Chardonnay from Napa Valley, California with a clean nose and palate of tropical fruit, light oak, and a crisp finish. By the time that our desserts arrived, a delicate Pavlova covered with lemon sabayon, crowned with sliced strawberries and fresh mint leaves, and surrounded with a generous mélange of sliced strawberries, blueberries, blackberries, and red raspberries; and a decadent and sinfully rich chocolate flourless cake with pecans that was presented warm, dusted with confectionary sugar, and garnished with sliced strawberries and mint leaves, the sky had fully made its dramatic transition deepening to a midnight velvetiness and had indeed kept its promise of a spectacular sunset that fully complemented Chef G's creative cuisine. Read other articles on The Pillars at New River Sound in the Hotels and Resorts section and Chefs' Recipes, where Chef G shares his delicious recipe for Butternut Squash with Star Anise, Ginger, and Lump Crabmeat Soup.